The yūrei of Japan have been riding taxis again. While they tend to eschew trains and busses, since taxis appeared around the late Taisho period yūrei have been hailing cabs for quick rides around town. In Japan Ghost Passengers, taxi drivers have been reporting ghostly passengers who climb on board, ask to be taken to a destination, then mysteriously vanish before paying their toll. The recent spate of ghostly passengers have been attributed to the 2011 Fukushima disaster, as the dead struggle to find their way home—or may not even know they are dead. The cabdriver knew that the ghosts of Japan were not confined to ancient graveyards and shadow-haunted shrines. Any modern resident of the nation’s capital could tell you that the taxis of Tokyo are more haunted than hearses, and his own route took him regularly through open gates to the spirit world. 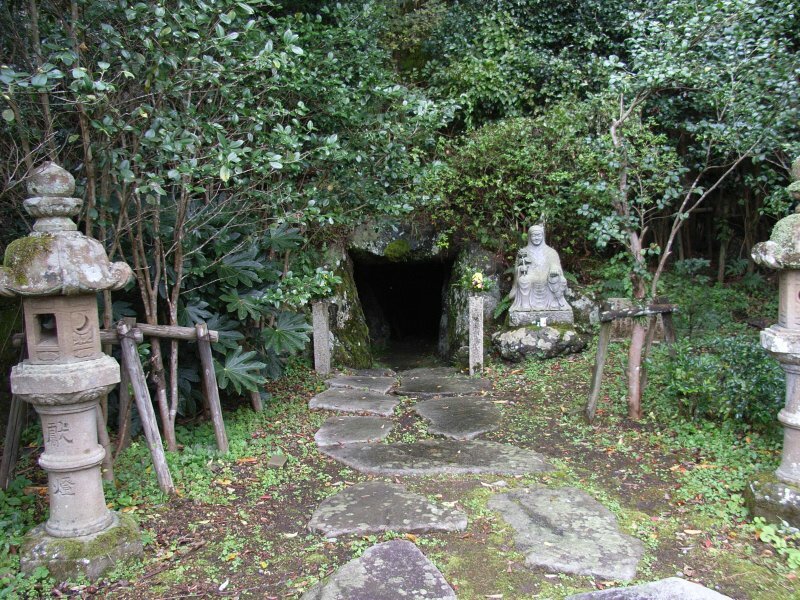 There was Sendagaya tunnel, which winds beneath the cemetery of Senjuiin Temple, or Shirogane tunnel, where legend has it that screaming faces are silhouetted against the tunnel’s pillars and through which the Shinigami – the spirit of Death itself – is said to pass. All of his fellow cabbies could wax a yarn of passengers who got on then disappeared, or of catching a glimpse of a woman or child’s face in the rear view mirror. He too had a story to tell. It was a stormy autumn night, near Aoyama Cemetery, where he picked up a poor young girl drenched by the rain. It was dark, so he didn’t get a good look at her face, but she seemed sad and he figured she had been visiting a recently deceased relative or friend. The address she gave was some distance away, and they drove in silence. A good cabbie doesn’t make small talk when picking someone up from a cemetery. When they arrived at the address, the girl didn’t get out, but whispered for him to wait a bit, while she stared out the window at a 2nd floor apartment. Ten minutes or so passed as she watched, never speaking, never crying; simply observing a solitary figure move about the apartment. Suddenly, the girl asked to be taken to a new address, this one back near the cemetery where he had first picked her up. The rain was heavy, and the driver focused on the road, leaving the girl to her thoughts. When he arrived at the new address, a modern house in a good neighborhood, the cabbie opened the door and turned around to collect his fare. To his surprise, he found himself staring at an empty back seat, with a deep puddle where the girl had been sitting moments before. Mouth open, he just sat there staring at the vacant seat, until a knocking on the window shook him from his reverie. The father of the house, seeing the taxi outside, had calmly walked out bringing with him the exact charge for the fare. He explained that the young girl had been his daughter, who died in a traffic accident some years ago and was buried in Aoyama Cemetery. From time to time, he said, she hailed a cab and, after visiting her old boyfriend’s apartment, asked to be driven home. The father thanked the driver for his troubles, and sent him on his way. The story has a basic pattern. A driver picks up a passenger; either a customer for a taxi cab or a hitchhiker. The passenger requests a destination, and the two chat a bit while the driver speeds along. When the arrive at the destination, the driver turns around to find the passenger vanished—always leaving some trace of the phantom passenger to prove they existed. The trace can be a lost glove, or a puddle of water from the rain, or evidence on a taxi meter. There is often some additional confirmation, such as a graveyard with their name, or a father coming out to pay the fare. They are always told as true stories, not legends—and maybe they are. In his yokai encyclopedia Mujara, folklorist and artist Shigeru Mizuki records a different type of haunted taxi—the driverless vehicles known as 無人車幽霊タクシ—Driverless Yūrei Taxis. In about 1931, there were rumors of a driverless taxi that drove the streets in the vicinity of the Imperial Palace. At night, taxis would line up for passengers, and they often saw a taxi whizzing dangerously through the streets. Looking inside they could see no one at the wheel. After the car was gone, they would look on the streets but could find no trace of its passing. However, those that saw the care would inevitably meet with an accident within two days. Taxi drivers that worked near the Imperial Palace were terrified of glimpsing the phantom vehicle. Similar driverless vehicles were reported on the Gotemba interchange between Tokyo and Nagoya, and in the Namba area of Osaka. Most reported the cars as white and travelling at unsafe speeds. There are older tales from the same area near Gotemba, of a white rickshaw that would travel through town without anyone pulling it. 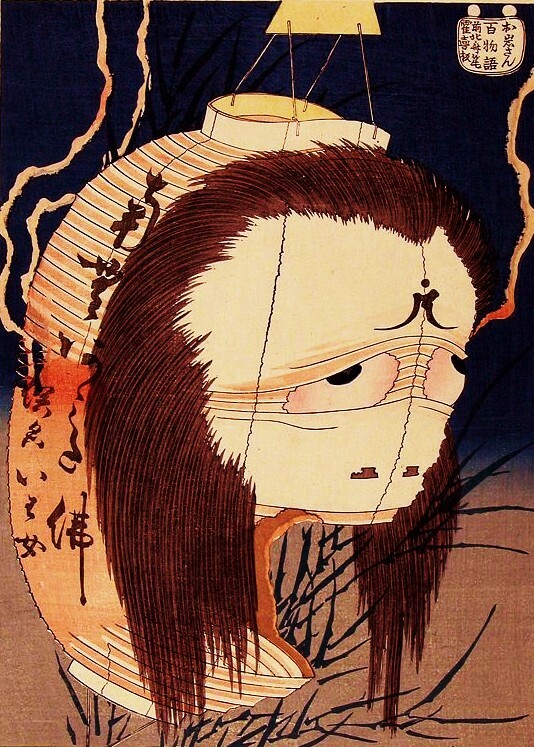 The rickshaw often had a family crest painted on the back, and was attributed either to a murdered member of that family, or to a yūrei from a nearby burial mound. Apparently across the years the spirit has upgraded himself to modern technology. Who knows what vehicle he may ride in the future? This entry was an answer to the numerous people who sent me the MSN story of modern taxi yūrei currently haunting Japan. It was great to see the ghosts of Japan are still up to their old tricks! And nostalgic remembering my very first yūrei article written more than 10 years ago! I also wanted to have something new for Folklore Thursday on Twitter! If you are a fan of legends and lore, join in the fun every Thursday! 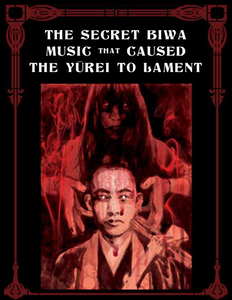 So, I promise not to turn this into a big advertisement for my works, but this current sale on Amazon is too amazing not to pass on to interested readers of Japanese folklore. 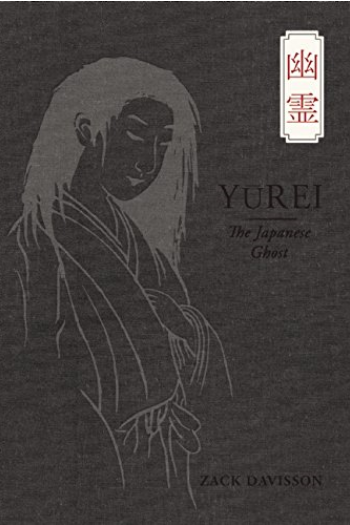 As I write this, Yurei: The Japanese Ghost is 52% off on Amazon.com. I can’t guarantee how long that discount will remain in place–this is all Amazon’s doing, not mine! But it’s a great chance for anyone interested in my book to get it at a super price! 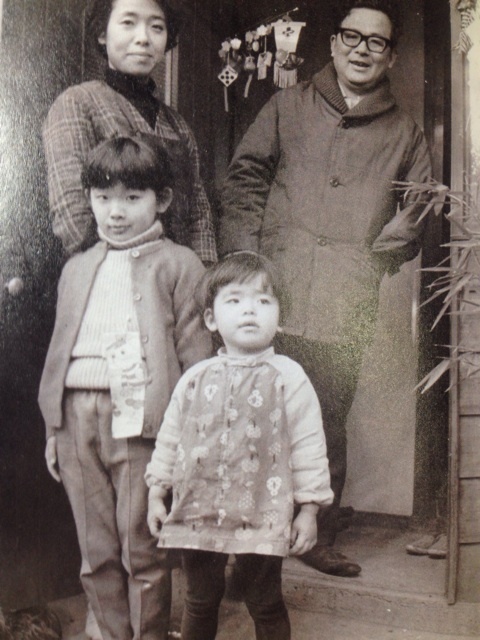 And if you are interested in any stocking stuffers, my publisher Chin Music Press has my translation of the Miminashi Hoichi (Earless Hoichi) story for sale for $5. Thanks! I do this site for free, and while I love it I really appreciate anyone supporting me and this site by buying some of my books and translations!!! Thanks for your support!!! I still can’t believe I am saying those words. 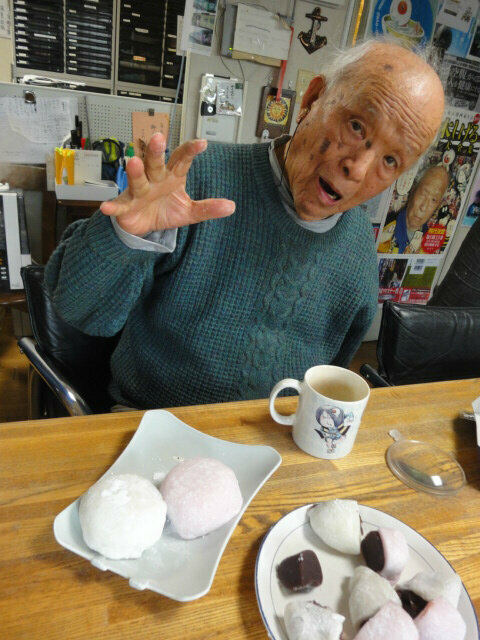 “I’m going to live to be a 100 … no, maybe 120 or so.” That’s what Mizuki used to always say. With the advance of every year he got closer to that number, and we just thought he would keep going on forever. “The gods decide when the end is, and we must abide by that,” Mizuki would say. He thought the best thing was to move on was peacefully without pain, and surrounded by family. When he fell at his house (NOTE: the fall that eventually lead to his death), it was devastating. But perhaps that was the gods’ decision as well. To my father, his family was the most important thing in the world. Even now he will continue to watch over us and protect us. And perhaps now he is in the company of his old comrades-in-arms who have welcomed him home. A final message to his fans and everyone he worked with. For a long time, you have supported our father. From our hearts, thank you. 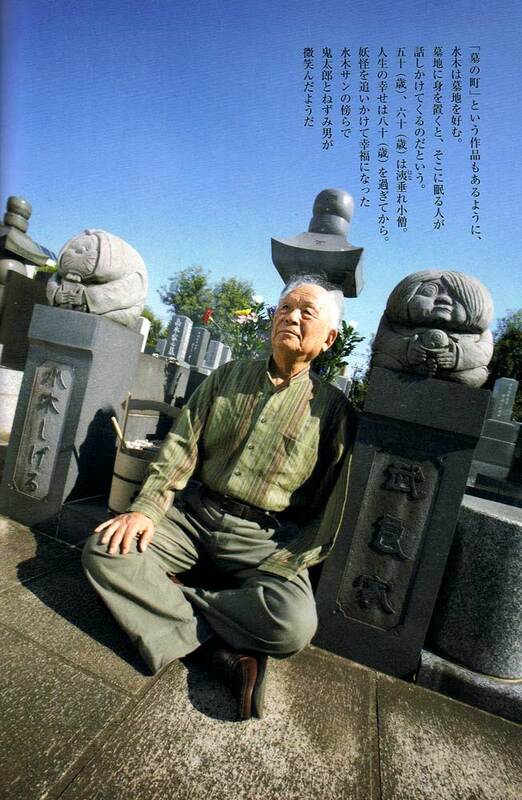 There is nothing sad about the death of Mizuki Shigeru. And I say this as someone who shed more than a few tears when I heard the news last night. He lived about as good a life that could possibly be lived; the ripe old age of 93; wealthy in every way that matters; respected by his peers; beloved. He died a good death. The only thing that is sad is that the rest of us now have to live in a world that doesn’t have Mizuki Shigeru. And we are poorer for it. To say that Mizuki Shigeru was a comic artist is like saying the Brothers Grimm crafted a quaint book of fairy stories or that Walt Disney made some cartoons. 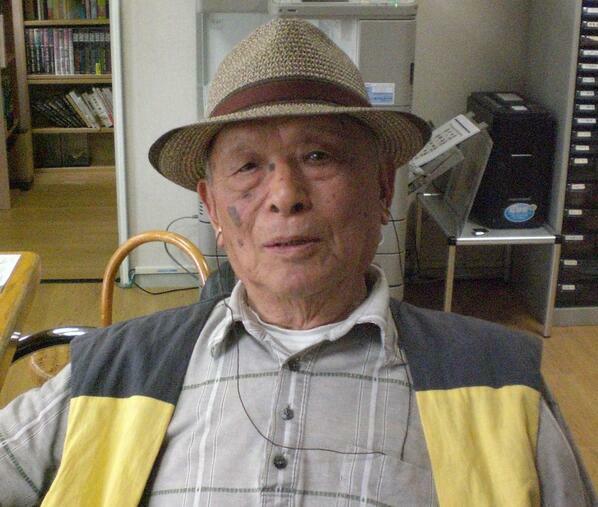 Mizuki was one of those rare human beings who unequivocally changed the world with his art. 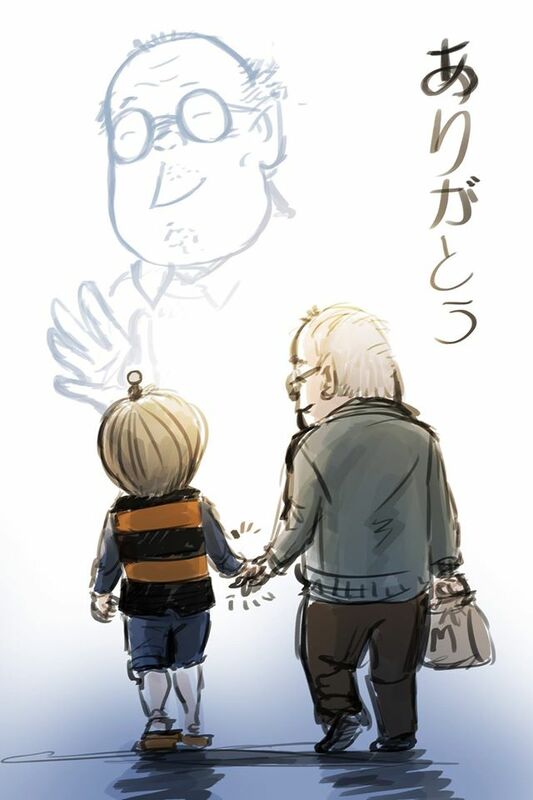 Without Mizuki the world—and especially Japan—would be a very different place. There would be no Pokémon, no Spirited Away or Princess Mononoke. His presence is so ubiquitous as to be almost unnoticeable. The way Mizuki saw the world has become the world. He saved the spirits and magic he loved from the darkness and gave them a new home. He was a visionary. A philosopher. A radical. A bon viviant of the mundane. Mizuki relished the simple, sheer joy of being alive. As someone who knew the actual soul destroying pains of hunger and the terror of hanging from a cliff by your fingertips while hiding from an enemy patrol, a cheap hamburger in a full belly brought him more delight than the most expensive piece of handcrafted sushi. 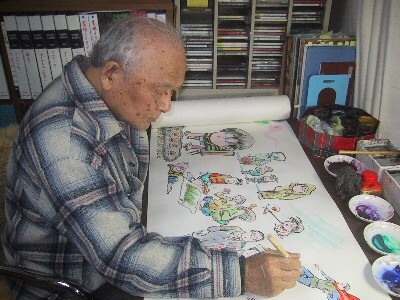 He believed in taking it easy, in enjoying life, and often scoffed at manga artists like Osamu Tezuka and Fujiko F Fujio who prided themselves on their hard work and long hours. They’re all dead, he would say, but I’m still here. Of course, he was a comic artist, and one of the best the world has ever seen. He was a natural born artist—a true prodigy who, like Picasso, could draw untaught with amazing precision before he could barely read. His teachers arranged his first solo exhibition of his works when he was in Elementary school. Mizuki himself often downplayed his talents, as he did everything about himself. But he was an undeniable genius. 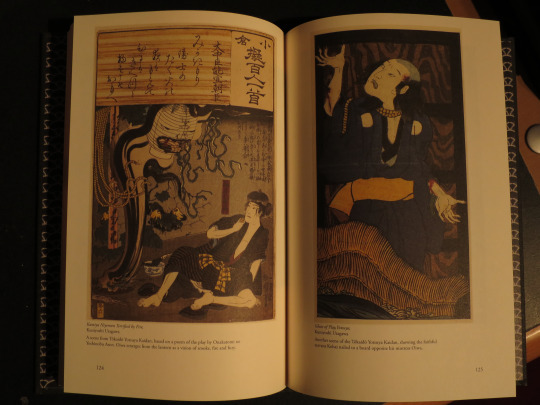 Coming back from WWII an arm short, it took him many years to rebuild his ability to its previous level, but his art grew like a tidal wave as he moved from kamishibai, to manga, to gekiga, to his yokai encyclopedias. I am sure there will be no shortage of articles recapping his extraordinary career. So instead I will give you something of Mizuki the philosopher. Mizuki Shigeru’s Seven Rules of Happiness. #7 – Believe in what you cannot see – The things that mean the most are things you cannot hold in your hand. #6 – Take it easy – Of course you need to work, but don’t overdo it! Without rest, you’ll burn yourself out. #5 – Talent and income are unrelated – Money is not the reward of talent and hard work. Self-satisfaction is the goal. Your efforts are worthy if you do what you love. #4 – Believe in the power of love – Doing what you love, being with people you love. Nothing is more important. #3 – Pursue what you enjoy – Don’t worry if other people find you foolish. Look at all the people in the world who are eccentric—they are so happy! Follow your own path. #2 – Follow your curiosity – Do what you feel drawn towards, almost like a compulsion. What you would do without money or reward. #1 – Don’t try to win – Success is not the measure of life. Just do what you enjoy. Be happy. 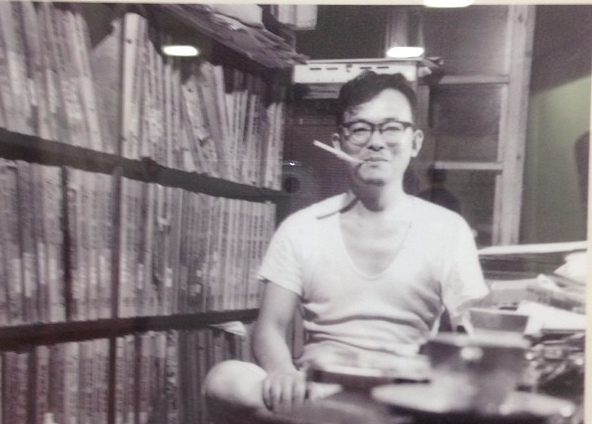 Mizuki Shigeru was in every way my hero. It has been my great honor to translate my hero’s comics, and share my love of him. I made a vow almost 10 years ago in a friend’s bar that I would bring this unique genius to the English-speaking world, and with Drawn & Quarterly I have made good on that vow. I am so happy that I was able to do this while he was still alive; it seems too often we only recognize great artists posthumously. One of my favorite photos is Mizuki holding the copies of Showa: A History of Japan that I translated, along with the Eisner Award they won for him. I now hope that we will continue to bring even more of his great legacy to a wider audience. He had so much to share. As for Mizuki himself, he did not fear death, and saw it as a natural part of a world that was full of mystery and wonder. Decades ago he designed and commissioned his own tomb, which he has referred to in interviews as his new home. He would often make jokes that he would be moving into his new home soon. I hope he finds it as comfortable and jolly as he had hoped. I am sure he is enjoying his well-earned rest amongst his yokai friends. They have been waiting for him for a long time. Here are Mizuki Shigeru’s works in English as currently available. If you haven’t already, please give them a try. The more you read, the more we can make. 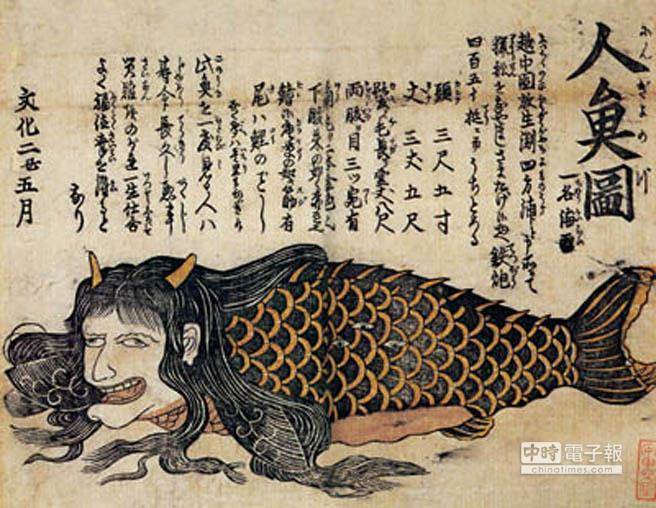 Japan has mermaids, but they are very different creatures from western folklore. They can take many shapes, but the most common in the form of a fish with a woman’s head. And even then, appearance is not their most distinctive feature—eating the flesh of a mermaid is said to grant an extended lifespan. And sometimes it does something else. One of Japan’s most famous folk legends, variations of this story can be found across the entire country. Most versions of the story involve a fisherman who catches a strange fish. He brings it home to cook for his family and a friend. The friend notices that the fish has a human face, and advises them not to eat it. The fisherman throws the fish away, but his hungry daughter slips into the kitchen and eats it any way. Cursed with immortality, she becomes known as Yaobikuni—the eight-hundred year nun. Here is an interesting variation translated from Takeshi Noji’s “Opinions About Life and Death as Told by the Legend of Yaobikuni” [八百比丘尼伝承の死生観]. Notice the difference about how the mermaid flesh is discovered. One day a man was invited to dine and be entertained at the house of another man whom he had never met before. 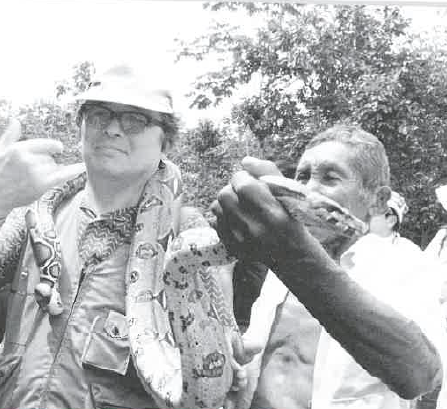 Now, this was a man learned in Buddhism and who had attended many lectures, and he knew that many such invitations lead to places such as the Palace of the Dragon King or to a dead man’s abode. He accepted, but was on his guard. When the feast came, he saw that he was being served mermaid meat. He was repulsed by the feast and did not eat it, but slipped some of the mermaid meat in his pocket as a souvenir of his strange adventure. Unfortunately, when he came home that night his daughter searched his pockets to see if her father had brought her a treat, and gobbled down the mermaid meat. From that time on she did not age. Her life become one of bitter loneliness. She married several times, but her husbands aged and died while she went on. All of her friends and loved ones died as well. Eventually she became a nun, and left her village to wander the country. At ever place she visited, she planted a tree—either cedar, camellia, or pine. 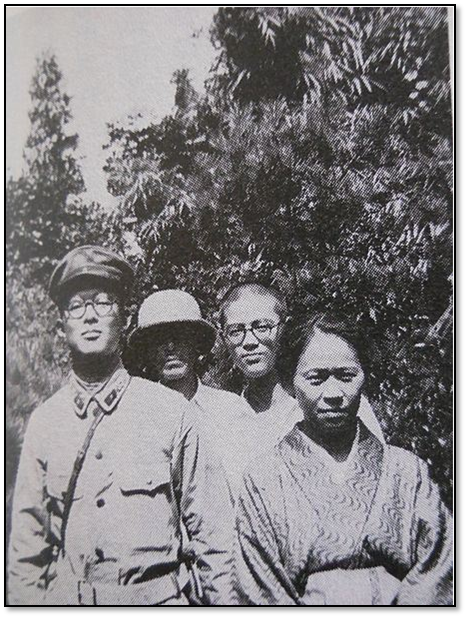 She eventually settled at Obama village in Wakasa province (Modern day Fukui prefecture) where she planted her final set of trees. The trees still stand to this day, and are said to be 800 years old. Normally, mermaid legends are found on port towns bordering the sea. 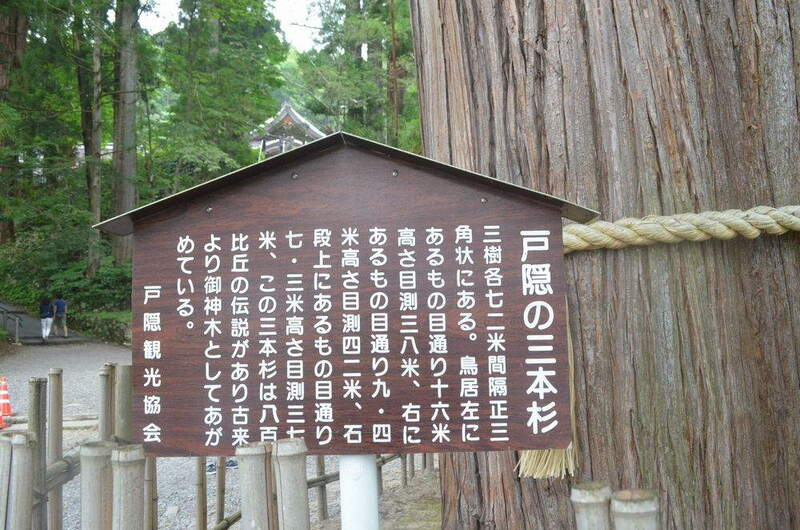 But this story comes from Togakushi of Nagano, approximately 65km away from the shore. This legend follows the same beginning as the well-known Yaobikuni legend, but adds it’s own cruel twist. One day, a fisherman caught a mermaid in the ocean. The poor creature begged for it’s life, but the fisherman didn’t listen and killed it. He brought the meat home to where he lived with his family and three children. The following day, when he was out fishing, his hungry children crept into the storage box in the kitchen and gorged themselves on the mermaid flesh. Soon after their bodies began to change. Their skin sprouted scales like that of a fish. At the end of their torment, they died. The father was wracked with grief, and bitterly regretted his actions. But it was too late. In a dream, a divine messenger told him “To save your children’s souls, make a pilgrimage to Togakushi, and plant three cedar trees to honor them.” The father did as he was told, and travelled the 400km to Togakushi to plant the trees. They trees are still there, called the Sanbonsugi of Togakushi (Three Cedars of Togakushi) where they are worshipped in a Shinto shrine. 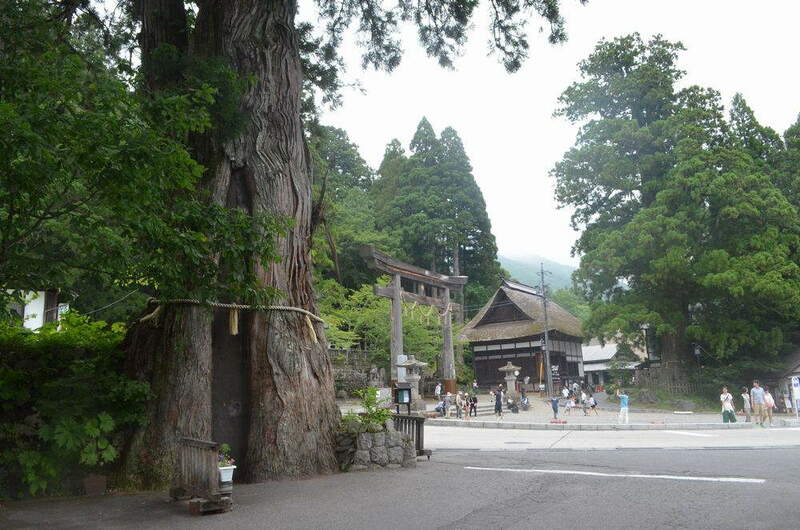 I came across this blog post on the Three Cedars of Togakushi, and thought it was an interesting legend to post about! However, you can’t really put the Togakushi legend into context without the much-more famous story of Yaobikuni, so there they both are! I like the variation of Yaobikuni that I found. Like the legend of Okiku, there are hundreds of different versions of her story spread all across Japan, each one changed in just a few key details. This one features a wily man who is too smart to fall under a spirit’s spell, but is then undone by his own daughter.